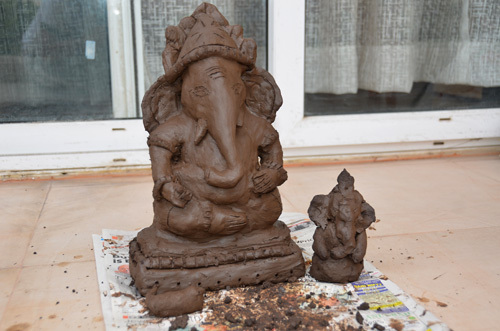 The last time i made (rather than purchase) a ganapati idol was back in Cyprus, where there was an abundance of good quality air-drying clay. We do get it here too, but they come in small packets at Hobby Ideas. 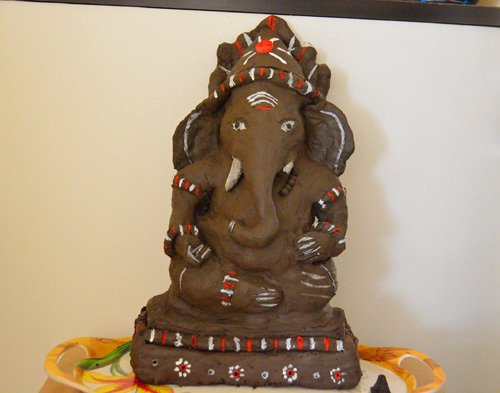 Last year, we had purchased an clay Ganapati. 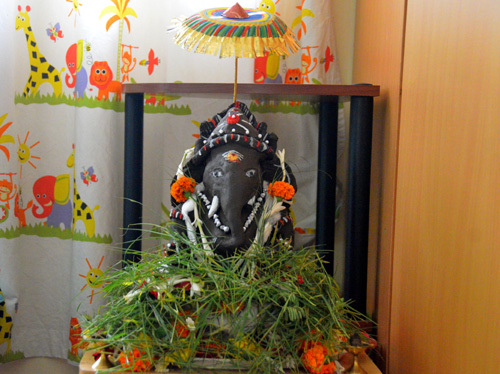 Finally, a little help from the house maid in getting some mud from the fields made way for a home-made Ganapati this year. First, the mud from the field had to “cleaned” to remove all the straw and other weeds. 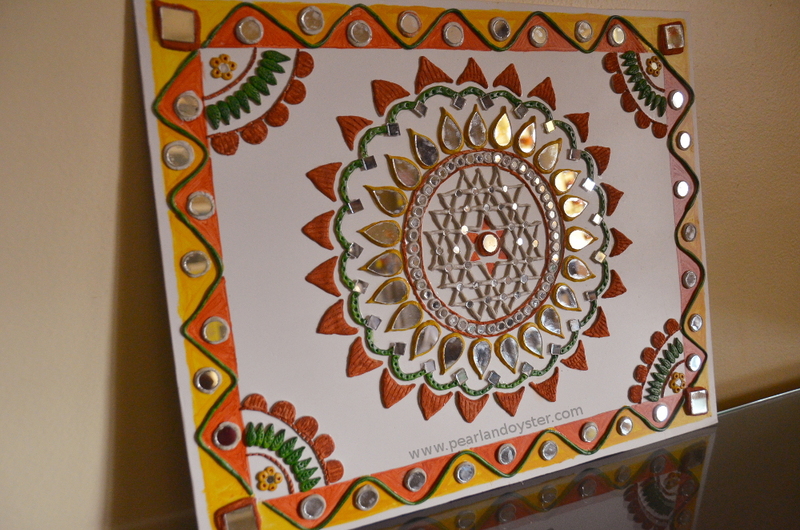 Then, the big pieces had to be broken down and the stones removed. Once this was done, water was added to make it a smooth mixture. Then, began the process of “modelling”. 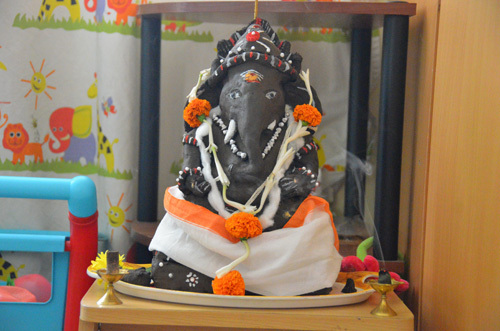 Even Akshara was into the act and made a small ganapati idol. 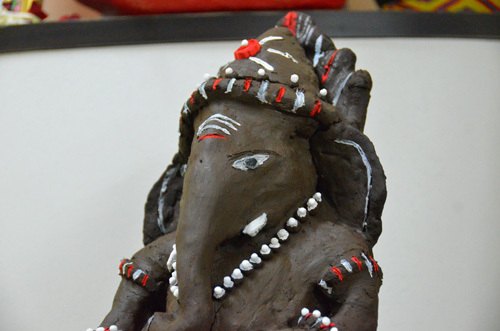 Then, i used small clay balls to make the white garland. 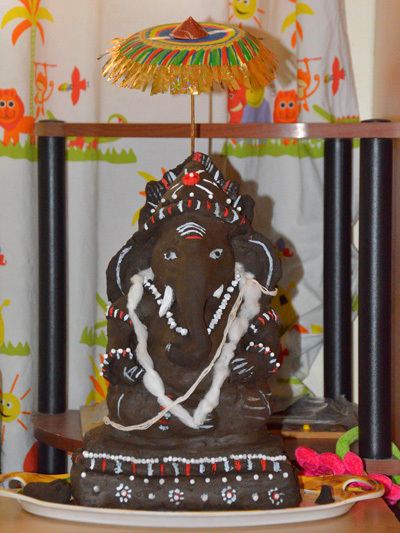 What is a Ganapti without an umbrella? I used an ordinary paper plate, coloured it to get the design and then wrapped the circumference with wrapping paper (with cut edges) to get the frills. 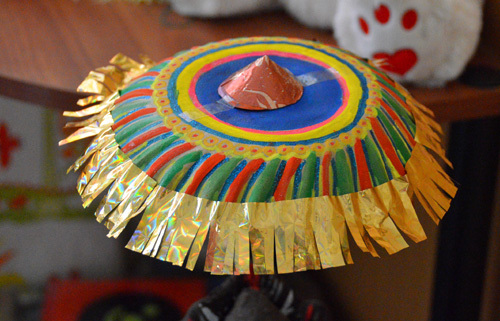 Now this umbrella was stuck into a tea candle kept at the opening of a water bottle (kept behind the idol), such that it gives the appearance of being placed on the idol. Then, came the dhoti. 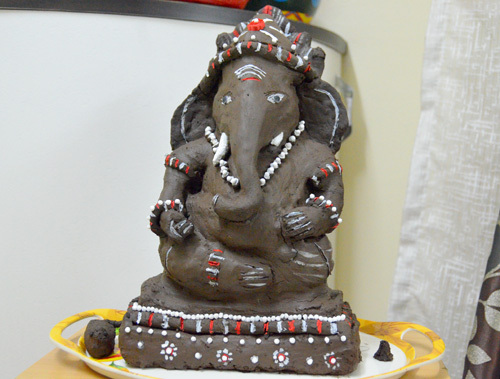 After that , Rajaram did something remotely resembling a Puja and our Ganesh Chaturthi was done! Next story Happy Birthday Rajaram! WOOOOOOW. TOO GOOD. KEEP IT UP. superlative degree of superthan po! was the smaller Pilliar really made by Kannamma? Super Pillaiyar, kalakkureenga! Thanks for sharing!! Vidhya, you’ve done it again. You have the creativity and also the patience to execute! Congrats to you & Akshara, [like mother, like daughter]! Wow.. Vidhya and Akshara well done.. 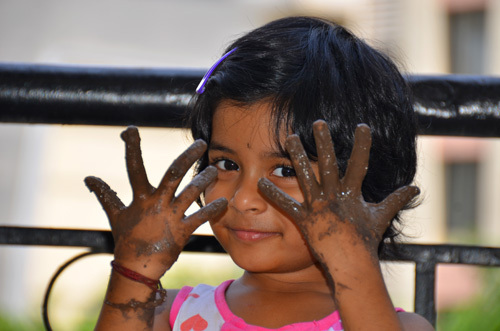 Hats off Vidhya … u r creative . Nice Idol.